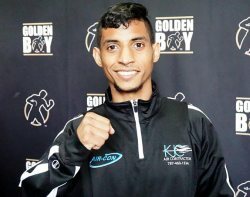 LOS ANGELES, CA (March 19, 2019): WBO Light Flyweight World Champion Angel "Tito" Acosta (19-1, 19 KOs) of San Juan, Puerto Rico hosted a media workout today at Legendz Boxing in Norwalk, Calif. ahead of his battle against Ganigan Lopez (35-8, 19 KOs) of Mexico City, Mexico in the co-main event of Garcia vs. Lopez on Saturday, March 30, 2019 at Fantasy Springs Resort Casino in Indio, Calif. and which will be streamed live on DAZN. Garcia vs. Lopez is a 10-round lightweight fight presented by Golden Boy and Miguel Cotto Promotions. The event is sponsored by Tecate, "THE OFFICIAL BEER OF BOXING" and Hennessy "Never Stop. Never Settle." The event will take place Saturday, March 30, 2019 at Fantasy Springs Resort Casino in Indio, Calif. and will be streamed live exclusively on DAZN.